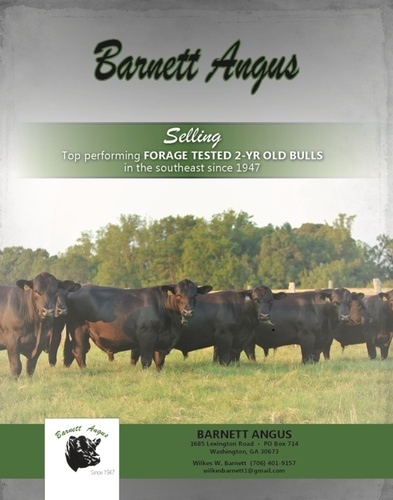 Barnett Angus has had a continuous registered Angus herd since 1947. They predominantly sell 2-year-old Angus bulls. The Angus breed was selected because of the breed’s high fertility rate and lower difficulty in calving. For decades, the Barnett Angus Farm was active in Georgia Bull Test Sales, becoming recognized as one of the top-performing Angus bull breeders in the state. The farm was named the 1978 Georgia Cattlemen’s Association Purebred Breeder of the Year and Marion Barnett was named to the Wilkes County Cattlemen’s Hall of Fame. Currently, Barnett Angus is farming approximately 3,300 acres with two-thirds being pasture land and the rest is timberland. It is owned and operated by Wilkes Barnett, son of Marion and Vivian Barnett and a 4th generation Barnett to farm and raise Angus cattle in Wilkes County.